This is a special vacation designed for food lovers, who are seeking to surprise their palates. Come to marvellous Andalusia, Spain, and try this short cooking course with your beloved ones, where you will develop the basic skills for cooking Spaniard-style, or get perfection in your existing talent with a professional chef and in a fun manner. This cooking holiday is about having enjoyable days and cooking amazing dishes. Finca Las Encinas offers comfortable rural accommodation, fine cuisine, and cooking courses, for those who appreciate good food and fine wines. It is thought that Finca Las Encinas has over 200 years old. It has been sympathetically reformed to the highest specifications, while keeping much of the original rustic features. Located on a vast private land full of protected oaks and fruit trees, it is set amongst the endless olive groves that have remained unchanged since the Roman times. Finca Las Encinas is situated in a tranquil hamlet, tucked away on the edge of a stunning nature park Parque Natural de la Sierra Subbetica, and it is centrally located in Andalusia, approximately equal distance from Cordoba, Granada, and Malaga, which makes a perfect base to combine the relaxation and joy of the cultural and historical wealth of this stunning area. Whether you want to unwind, explore the heart of Andalusia, or do the cooking courses for a culinary retreat, your stay at Finca Las Encinas will be an unforgettable experience. Guests will be provided with several bedrooms options, in order to match the best accommodation. You can stay in a standard room or a suite. This is a twin bedroom on the ground floor with en-suite with shower, low olive beamed ceiling (2 meters from floor to the ceiling) and private terrace view of wooded area. The Lucerna room is double bedroom on the first floor. It has two levels (some steps going down to the bedroom), en-suite with shower, a high beamed ceiling, side and back garden view. This is an annex suite on the ground floor with terrace, open-plan double bedroom or lounge, en-suite with a bath tub and shower, private entrance, and private terrace with view of the wooded area. Cot can be provided for free and extra bed can be added for additional cost. Relax in an en-suite twin bedroom, with rustic olive A-frame beams, and view of the pool and the surrounding olive groves. 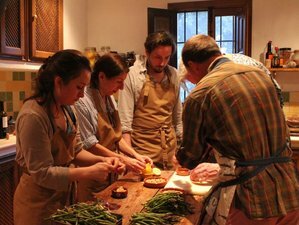 Finca Las Encinas offers cooking courses to small groups of up to four people. Their hands-on cooking courses are led by friendly, informative, and professional chefs. Historical and cultural backgrounds of ingredients or recipes will be discussed during your cooking classes. Improve your cooking skill with both traditional and modern culinary techniques. With your host chef, you will prepare three-course menus. The main idea of the course is to cook seasonally, using freshest ingredients, picked directly from an organic vegetable garden or fruit trees, or sourced from neighboring farms. Finca Las Encinas specialty is Spanish, Andalusian, and generally, Mediterranean cuisine. Nevertheless, by prior arrangements, your chef can teach you almost anything you wish. At the end of the day, you will enjoy sampling what you and your cooking partners have achieved. Finca Las Encinas is very flexible. You can join in the cooking courses as much or less as you would like. Finca Las Encinas is able to customize your program to suit your interests, needs or levels. If you would like to cook any particular recipes, please let them know. Non-cooking partners are very welcome and will have a plenty of opportunities to relax or enjoy a number of activities available in the are). Non-cooking partners are on half-board basis (breakfast and 3-course dinner). We are a non-smoking establishment throughout. It is not permitted to smoke inside or all exterior/patio area where guests use or near the house and pool, including the guest terraces. Clive was born and bred in Cardiff, Wales, in the UK. He has been a professional chef for almost 20 years since he started as a trainee chef at a French restaurant whose master chef is an elite graduate of Cordon Bleu School in France. After having trained there for six years while studying at a local catering college, he went on to work at a few prestige restaurants in Cardiff and London to expand his vision and develop new styles of cooking. Clive has worked as a successful head chef (specializing in French-Mediterranean cuisine, with a touch of Eastern taste in several parts of UK). This cooking holiday will take place in the natural preserved Parque Natural de la Sierra Subbetica, in Andalusia, Spain. Iznajar is a pretty lakeside village, sitting at the top of the rock with the eights century Moorish fortress, overlooking the reservoir called the Lake of Andalusia, as well as the church quarter, which dates back to 16th century. Enjoy fishing, sailing, hiking, or have a lazy day out at the Valdearenas Beach. The Subbetica region is bounded by Iznajar to the south, Zuheros to the north, Lucena to the west, and Almedinilla to the east, covering over 30,000 hectares. It has a rich historical, archaeological, cultural, and natural heritage, which is appreciated by visitors of all kinds. This is only a short list of places in the Subbetica region that you may find interesting to visit and can be reached within a short drive from Finca Las Encinas. This is the capital of Subbetica, also said to be the least-known Baroque wonders of Andalusia. This picturesque town sits at the foot of the highest mountain in the province of Cordoba, La Tiñosa. You would find many architectural treasures, including the magnificent national monument and King fountain. Do not forget to stroll around the narrow alleys of the Barrio de la Villa, particularly when flowers are in bloom. Well-known for its anis (anise-flavored liqueur), Rute is a picturesque whitewashed town on a hill, overlooked by the delightful mountain range. There are a few museums that are worth visiting, such as the anise and cured ham museums. It is also a home to the internationally renowned Donkey Sanctuary, ADEBO. Zuheros is lying in a gorge, backed by masculine rock cliffs. It is one of the most popular Subbetica villages, particularly amongst keen hikers and painters, as there are plenty of well-signed footpaths in the beautiful nature park. La Via Verde de la Subbetica (or green way of the Subbetica), which is a 58 kilometers long path linking Lucena, Cabra, Doña Mencia, Zuheros, and Luque, is one of the most stunning routes. The route was once used to transport olive oil by train to other parts of Spain and it has now been lovingly restored for the use of hikers and cyclists. Another popular route is a hike to a cave with Neolithic cave paintings. You may find some of the best goat cheeses and olive oil of the region in the village square. During this Spanish cooking holiday, you will delight with daily delicious breakfast and three dinners. Breakfast is served between 08:00 and 10:00, and it consists of a choice of freshly squeezed fruit juice, a variety of home-baked bread, locally cured ham, local cheeses, seasonal fruits, home-made jam and marmalade, and coffee or tea. Using the finest freshest local produce as much as possible (a lot of the vegetables used are grown on their grounds), regional specialties, classic Mediterranean cuisine and chef's original recipes are served in a dinner party style. Two or three-course dinner is served from 20:00, barbecues are also available in summer. If you have any special dietary requirements, please inform Finca las Encinas in advance. You can take another cooking session at 75 EUR. Finca Las Encinas can organize self-guided excursions for you. During an olive oil tasting you can learn and be educated under the guidance of an award winning professional taster who works for the Protected Denomination of Origin, while the wine tasting helps you discover the lesser known denominations of wine of Spain. Look, smell, and taste five different types of wine at one of the oldest wineries in Spain. Outdoor activities that are available in this area are: bird watching, canoeing and kayaking, cycling, fishing, golf, hiking and walking, horse riding, hot air ballooning, paragliding, sailing, swimming, and much much more. There are a few outdoor pursuit specialists in the area and should you need any assistance in booking, please do not hesitate to contact Finca Las Encinas before your visit. Leave the airport keep right to continue towards N-340 Málaga. At the roundabout, take the second exit and stay on N-340 Málaga. Take the MA-20 slip road to Benalmádena / Algeciras / Cádiz. Keep left at the fork, follow signs for Antequera / Sevilla / Granada and merge onto MA-20. Use the left two lanes to take the exit towards MA-20/Almería, A-45 / Córdoba / Granada / Sevilla. Use the right two lanes to take exit 241 for A-45 towards Córdoba / Granada / Sevilla. Use the right two lanes to take exit 114 for A-92M towards Granada. Take exit one towards Camacho / Salinas / A-333 / Villanueva de Tapia. Turn left at the junction following the sign for A-333 Iznájar and continue until you see Lake Iznájar. After crossing the first bridge over the Lake Iznájar, ignore the sign for Iznajar and continue straight ahead. There should be Restaurante Casa Juani on your left, cross the second bridge passing a building merchant on your left. Find a green 47 kilometers sign, and a green petrol station on left immediately after that. Take a right turn towards A-333 El Higueral / Priego de Córdoba / Los Juncares. Drive until you find a green road sign, A-333 42 kilometers on your right, and drive further for 400 meters. You will find a white sign “Los Juncares”. You should see a green bus stop or shelter on your right. Take the left turn immediately and driver up. Go straight up a gradual hill for approximately 800 meters and take the second left turn (there should be an enormous oak tree in the corner with a small red square sign attached). Continue for a further 190 meters and the finca is located on your right, just after passing a large car port on the right hand side of the road. On your left, you should see green and yellow communal waste bins. Directly opposite the bins, there is a small Christian shrine under the big oak tree (but you may not notice it until you have passed our entrance). Drive up to the car park where you should see a garage with blue doors on left. Leave the airport and follow the sign for A-92 Malaga, Sevilla, and Antequera. Following A-92, slight right for Malaga / Sevilla. Take the exit for A-333 Camacho, Salinas, and Villanueva de Tapia. Turn right at the fork. Turn left at the junction following the sign for A-333 Iznajar and continue until you see Lake Iznájar. Please book your flight to arrive at Federico García Lorca Airport (GRX) or Malaga Airport (AGP). From either of the two airports, you can rent a car to get to the location. Finca Las Encinas offers comfortable rural accommodation, fine cuisine, and cooking courses for those who appreciate good food and fine wines. This vacation is available all year round except in August, on Christmas and New Year. Recommended time is March to July and September to November,.